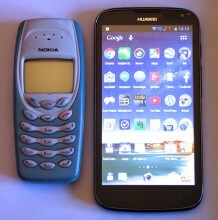 Now it has finally happened, and I thought it would never come to this: last week, I finally bought my first smartphone! 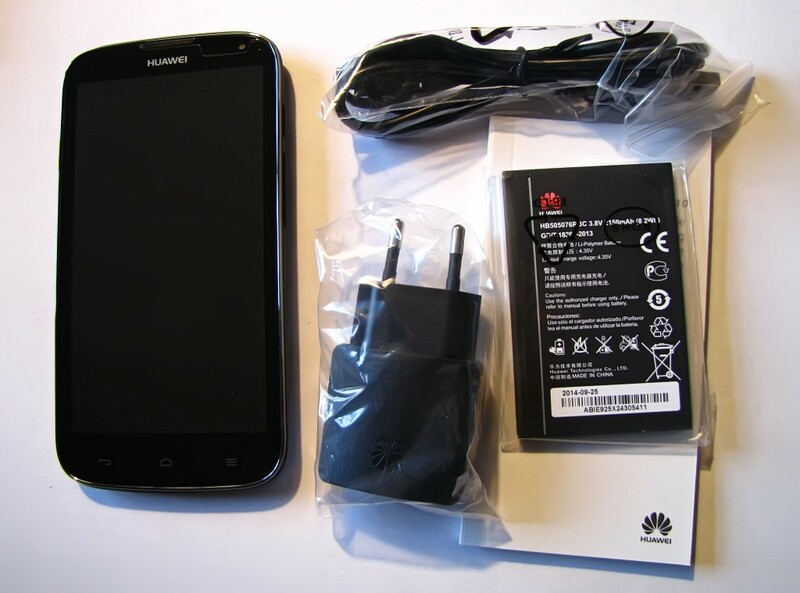 After using a Nokia 3410 for more than a decade, the low smartphone prices finally were no argument anymore against getting one and after some considerable deliberation and searching, I finally found the Huawei Ascend G610, the ideal phone for me. It’s not the latest and newest model, but the advantage of this was that I was able to get it for a price of only €114, which is incredible for an Android smartphone with a 5″ display. Specification-wise, this phone is definitively on the lower end, but it still has a lot to offer and is as much value for money as you will ever be getting. The phone has some small drawbacks and weaknesses, but they far outweigh the more than reasonable price and the otherwise very good quality. 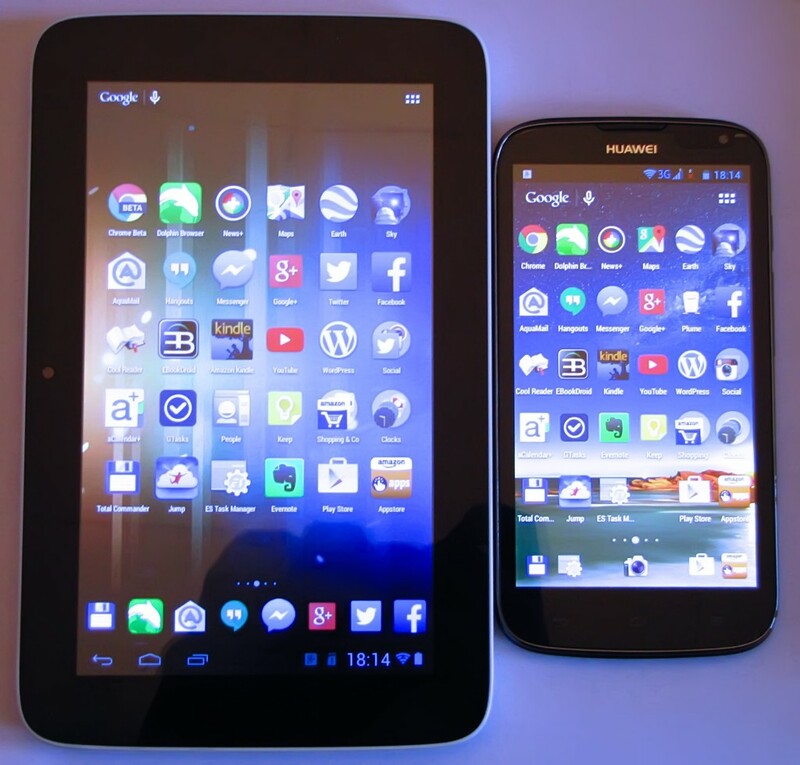 Almost three years ago, I wrote a long review about my first Android tablet, still in German back then, and later I skipped doing this my second tablet. But this phone really needs a thorough review because there are some surprisingly inaccurate articles out there complaining about a lot of non-existing problems and I just want to clear some of that up. I’m not getting paid for this review and have no connections to the manufacturer or seller. Specifications – What’s under the hood? 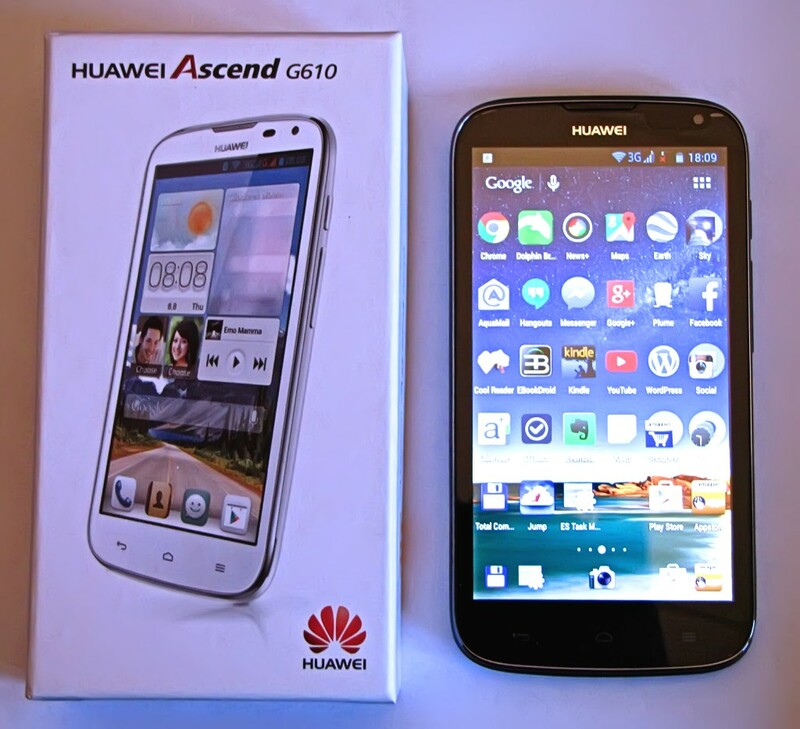 The smartphone comes in a surprisingly small sturdy cardboard box with a nice and professional design, which shows the white version of the Ascend G610 on the front regardless which one you bought. I purchased the black version only because the white one cost €10 more, but both look very good and I suspect the backshell of the black version might be less susceptible to dirt and scratches. The phone weighs about 170g and is not really a lightweight, but feels very solid in the hand and is easy to hold. 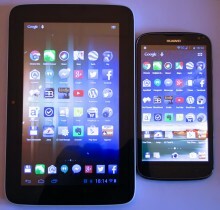 Due to the size it’s not really good for one-handed operation – the G610 is almost a mini-tablet and much bigger than e.g. a PalmOS PDA from a decade ago. The box contains the smartphone itself, the USB charger with a too-short USB cable, headphones with an integrated microphone, the battery and a multi-language quickstart booklet, which just contains some basics and nothing really about operating the phone. For the first quick start, popping off the backshell (which is kind of tricky but manageable) and inserting the battery is enough. On first launch (and only then), the phone takes a worryingly long time to start, more than a minute and a half, but then the Huawei logo is replaced with a quick and somewhat noisy welcome animation. Then the standard Android setup questions are asked, which can actually be mostly skipped and put in later. 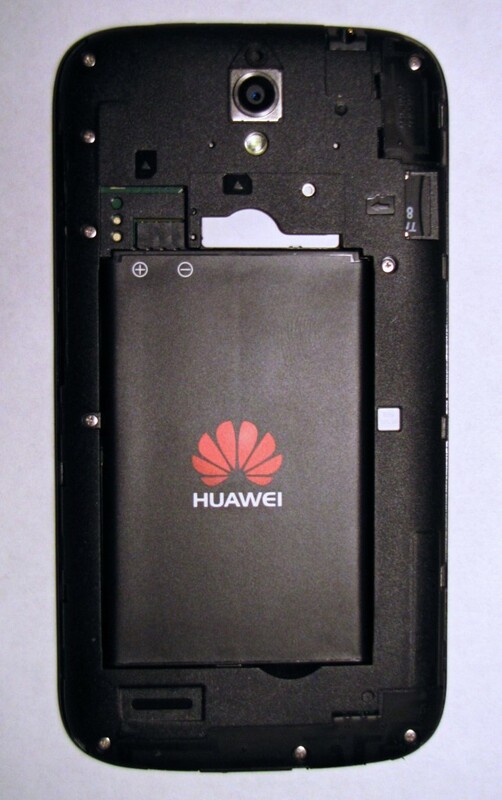 On the back is the slot for the replaceable battery (one of the main reasons to buy this or any of Huawei’s phones), the two SIM card slots (one is inserted in the photo) and the slot for the MicroSD card on the top right. The SIM slots are for normal-size mini SIM cards, so you don’t have to cut down your card or get a new one from your phone company. Only the first slot can be used for UMTS/HDSPA high-speed data connections, the second one is only capable of GRPS. The phone launches with Huawei’s own EmotionUI, which is actually just their own launcher and a slightly modified, Apple-style user interface. The launcher is, honestly, not very good and puts all installed apps on the home screens, completely getting rid of the app drawer. Fortunately, it can easily replaced by any other launcher (I recommend the very lightweight Nova Launcher). While the system interface itself cannot be modified, it actually looks very nice and has, of course, the same functionality as on every other every Android device. Quite a few programs come preinstalled or as system apps on this phone, among them, of course, most of the Google apps, which all have to be updated once the network is set up – it is advisable to first set up the WiFi, because a lot of data is transfered on the inagural launch setup. It takes about 30 minutes for the phone to update all the apps once you have logged into your Google account, but you can still use it in the meantime, even to make calls if you have put in your SIM card(s). More about the operating system and software later in the article. The Ascend G610 has an easily removable backshell, which is made out of a slightly rubbery plastic that is not easily scratchable and is easy to grip. The front is all glass with a silver plastic rim around it that does not protrude over it, although the backshell is a little thicker on the top and bottom while it lines up comfortably on the sides with the display edge. This phone does not look cheap in the least and has a nice, solid feel to it. Despite the large display, the size is small enough to be held with one hand and with slightly less than 170 grams the phone is heavier than most competitors, but still comfortably usable. The Ascend G610 has five hardware keys. There’s a power button and a combined volume whip on the right side of the display, which are actually part of the removeable backshell and have a slightly rubbery feel, but give a good tactile feedback without being too noisy. 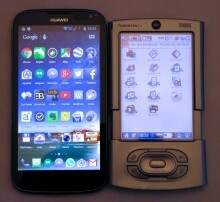 The standard Android back, home and menu buttons are not part of the display, but are located below it as hardware keys on a dedicated silkscreen area. They are not permanently illuminated, but light up on contact with them or the touchscreen, which is helpful especially in the darkness because the icons are only really visible in daylight. There have been complaints that the buttons need two or more taps to react, but actually they work if you touch them in the middle – the sensitive area is quite small and tapping on the wrong part of the silkscreen is more the cause of seemingly non-functioning buttons. 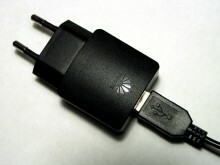 There are only two connectors on the phone: a 3.5mm headphone jack on top compatible with headphones with integrated microphones and the USB connector on the bottom. The USB port is used for charging, but can also be used to connect the phone to a PC for access to the internal and external SD cards, which are automatically mounted into the operating system as drives. The USB interface is not host compatible, so you unfortunately can’t hook up other USB devices like harddrives, flash card readers, keyboards or mice to it, but that is more a tablet feature than something for a smartphone and Bluetooth input devices should still work. 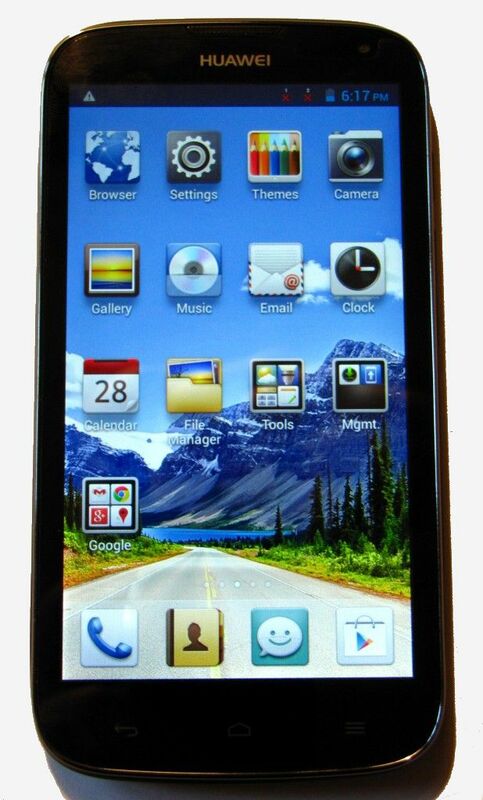 The screen of the Ascend G610 is the most surprising feature considering the price of the phone. The front is, of course, not Gorilla Glass, but nevertheless very solid and certainly not something made out of simple plastic. My phone came with a protective screen foil on it, which I simply left on because it is hardly noticeable and does not make any problems with the touchscreen. Although the display only has a qHD resolution of 960×540 pixel, the density is a very satisfactory 220 ppi, making individual pixels only visible at extremely close range. The photo on the right was captured with the camera lens basically touching the display. Compared to a cheap 7″ tablet with 1024×600 resolution and a pixel density of 167 ppi, this phone looks sensational. Everything is crisp, detailed and above all, very bright – this screen even looks great under direct sunlight and the (optional) automatic brightness adjustment works very well in any situation. The display has only a little bit brightness falloff when viewed from any angle. The colour balance leans slightly into the warmer, more red spectrum, which makes the display very easy on the eyes. The size is still big enough even for web browsing and as can be seen on some of the photos in this article, it is possible to squeeze 25 icons on a launcher homescreen in a reasonable size (the closeup above was taken on exactly such a launcher screen). The touchscreen works perfectly even with the relatively thick display protector on it, there is no need to press hard anywhere on the screen. Overall, this display is practically perfect considering the price of the phone and the relatively low resolution does not look bad at all on this size. The Ascend G610 comes with 1 Gigabyte RAM, which is comfortable enough for today’s Android systems and lets you run a lot of programs in the background without slowing down the system too much. The flash storage space is only 4 Gigabytes big, of which only about 2.2 GB are free, although this is mounted as a whole partition and not split up into a system partition and an internal SD Card. There is a “virtual” SD Card mounted on the main file system for compatibility reasons, though. While this is really not very much space and can fill up pretty quickly, the slot for MicroSD cards is of very great value here, because the system allows to move app to the external SD card – there is even an option in the system settings to make this the default. Officially the phone supports a maximum of 32 Gigabytes per card and while I have not tried a bigger one, there are reports that you can use up to 128 Gigabytes if you format a card with FAT 32. The relatively small internal flash memory should not be a reason not to buy this phone, because it can easily be expanded and most apps can be moved to the external card. The Ascend G610 employs the MediaTek MT6589 chipset, which contains a modest ARM-7 CPU with four cores running at 1.2 GHz each. This is not the fastest CPU ever put into a smartphone, but it’s enough to make the everyday system operation very speedy and with the quadcore processor there is little chance of apps running in the background clogging up the system. While several benchmarks put this phone on the bottom of the list (Antutu pegs it at about 15750), compared to my 2013 tablet with an 1.6 GHz dualcore CPU it feels much faster and a lot less laggy especially in resource-hogging apps like Google+ or Facebook. The phone also does not get noticeably warmer when using resource-intensive apps or games. The graphics chip is a PowerVR SGX544MP2 from Imagination Technologies, which is apparently used in a lot of other phones of a much higher caliber. I have not tested any 3D-heavy games, but together with the quadcore processor it should be adequate for most of today’s games – although I would not expect any wonders regarding game performance. Simple, non 3D games seem to work absolutely fine and emulators even for 16-bit systems are certainly no problem at all. The main camera of the Ascend G610 has a resolution of 2560×1920, almost 5 megapixels, with an autofocus lens, LED flash and a light sensitivity from ISO 100 to 800. 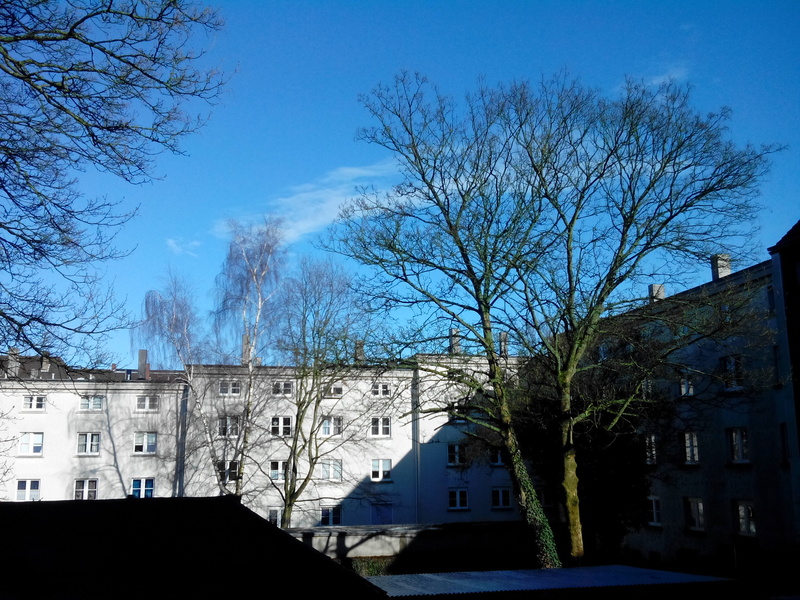 Click on the image on the right to get the full unaltered camera original, taken with image quality and size set to maximum. The quality is acceptable, although nothing to write home about compared to a proper digital camera, which is entirely expected in this price range. The photos are still surprisingly detailed and the only concern is the relatively high amount of noise, probably caused by the small sensor. The autofocus works well even in low-light conditions and it focuses down to a distance of about 3.5cm, making decent macro shots possible. It is not a particularly wide-angle lens, maybe with a field of view comparable to a DSLR 35mm lens. The LED flash is not particularly powerful, but enough for snapshots. The Huawei camera app is simple in design, but very functional with a lot of settings – while f-stop, exposure time and focus cannot be directly controlled, there are many possibilities to control the colour and even the ISO can be manually set. The only drawback of this camera, regardless of which app you use to take photos, is that it produces a loud shutter noise even when the sound is turned off completely. 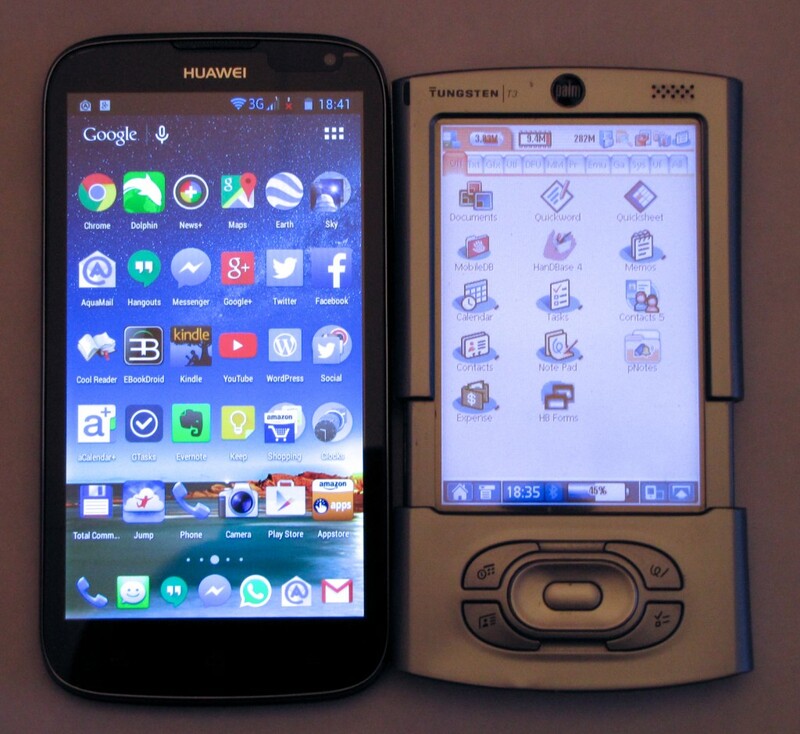 The front camera, located on the top right of the screen, is only a 0.3 Megapixel 640×480 VGA webcam and basically only good for video telephony. The quality is decent in good light conditions, but this is definitively not a selfie camera because still pictures taken with it are not really good at all.. On the other hand, it works perfectly as a video camera for Skype and Google Hangouts with none of the compatibility issues some other phones have. There are two speakers and two microphones on the Ascend G610. The usual phone speaker on the top of the screen can be seen behind a small grille and sounds absolutely fine considering it is just meant for speech. The other speaker is on the lower left of the back and is automatically used for media playback and alarms – the sound is, of course, entirely without bass, but nevertheless surprisingly clear and undistorted, making it perfect for speech playback even at the highest volume. 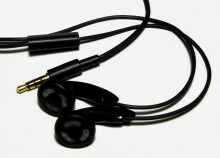 The headphone jack is on the top slightly to one side and supports headphones with built-in microphones like the one that comes with the phone itself. While the supplied headphone sounds somewhat hollow, it is enough for telephony and speech and if you plug in a better pair of headphones, this phone turns into an amazing sounding audio player with an absolutely impeccable quality free of any background noise. The first of the two microphones is on the bottom next to the USB port and picks up the voice during phone calls, but also seems to be used for most apps recording sound except during video recording, when another microphone located directly above the camera lens is used. Some apps, including the preinstalled sound recorder, allow audio recording with both microphones at the same time, making stereo recordings possible. The quality of both microphones is very good and much better than just for voice recording – music, especially acoustic guitar or piano sounds surprisingly full and undistorted, so this phone might even be a good as a quick note-taking device for musicians. The Ascend G610 has a replaceable Lithium-Ion battery with 2150 mAh, which makes out a sizeable portion of the phone itself. But the big battery is worth it, because it lasts for quite a long time for a phone in this price range. While it is not in the range of really expensive models, a few days of testing has revealed that you can expect at least 13-14 hours with heavy use of phone calls, web surfing and lots of screen-on time and more than 16 hours with less intensive use. In standby mode with switched-off WiFi and mobile data, the phone loses less than 2% charging in six hours, so the standby time might well be more than 24 hours and maybe even days. I don’t have much experience with other smartphones, but I find this exceptional and certainly had not expected such a high battery capacity. Because the battery is replaceable by the user without having to dismantle the whole phone, Huawei makes this a very versatile and long-living phone. New batteries can be found on Amazon or Ebay for prices between €10-€15, at least in Germany. The phone is charged through the mini-USB port and the included charger is actually just one with a USB port and an ordinary USB cable. It puts out the usual 5 Volts at 1A and charges an empty Ascend G610 in about 2 1/2 to 3 hours, which is fairly fast considering the capacity of the battery. Charging with a computer USB port works too, of course – but on ports delivering only 0.5A it takes about twice as long, so a dedicated charger is the best option. Because the phone has a standardized USB port, you can also use any portable USB power bank to charge on the move. The main feature of the Ascend G610 is, of course, the dual SIM capability. Both slots are capable of standard GRPS connections, but only the first one also supports 3G UMTS with the HDSPA extension, with data transfer rates of theoretically up to 22 mbit/s. You can receive normal phone calls on both cards, but if one card receives a call, the other one is switched off including the data services – this is called Dual-SIM Standby and standard for a phone with two SIM card slots. It still saves having to carry around two phones if you need two mobile connections and the phone of course also works if you use only one card. Just be sure to use slot #1 (the right one) if you want to use 3G data connection on a single card. The phone interface is simple, but very efficient and coupled to the standard Android adress book, which is used to call up the phone numbers of your contacts. You have the usual features with a big dialpad and buttons for activating the speakerphone and muting your microphone – everything looks like stock Android except the light Huawei colour theme. The top speaker has a decent, everyday quality and is certainly good enough for phone calls and the standard volume, adjustable with the volume controls is loud enough to hear even in noisy environments. You can also switch to the back speaker for hands-free operation or use the headphones – if you use the ones that came with the phone, the built-in microphone will be used to pick up the voice, but honestly the microphone of the phone itself sounds much better. The text messaging comes as a separate app, which seems to be stock Android fare again and has only very basic features. It nevertheless works very well and you even have the option to import messages stored on the SIM card. There is also the option to integrate SMS messaging into the Google Hangouts app or use the new Google Messenger. The WiFi module of the Ascend G610 plays along perfectly with my older Netgear routers and picks up even more other access points from the neighbourhood than my already pretty receptive tablet. Although I only use a 54 mbps connection due to the older routers, the speed is excellent and the connection remains stable even when the signal is weak further away from the routers. I did not have any problems with logging in the WLAN or the encryption even with some heightened security measures like manual IP setup – all the usual settings are there and you also have the option to turn your phone into a mobile WiFi hotspot, although I have not tried this out yet. Another important feature which I have not yet been able to test is the mobile data access, because I use a prepaid debit card and the data flatrate has to be paid for separately. I will try this eventually, but since everything above 500 Megabytes is somewhat expensive and I use the phone mostly as a mini-tablet at home, I haven’t had real use for the mobile internet connection yet. There’s also the problem that the UMTS/3G coverage right in our house is very weak, but this is a known problem and has nothing to do with the phone itself. The 3G reception everywhere else is actually pretty good based on measuring alone – we just seem to be in a kind of dead spot between cellphone antennas. I will update this paragraph sometime later when I have been able to test the mobile data access. The GPS has actually been a bit difficult to get to work, but this seems to be a general problem of all devices with MediaTek chipsets. The main problem is that the GPS does not work well inside buildings, but outside it is actually relatively easy to get a GPS fix and the accuracy is well within a couple of meters if there are enough GPS satellites in view. To check the GPS status of the phone, I recommend an app like GPS Test to see what’s actually going on with the GPS reception. It may look like the GPS module is dead, but it is actually just the weak reception easily fixed by going outside or just standing in front of a window. I’m genuinely surprised that FM radios are still built into smartphones today and this one works very well. Headphones need to be plugged in for the radio to work and the app is somewhat basic, but it supports scanning for channels and you can even record with it. The quality is as good as FM radio allows and perfect if you just want to listen to the news or your favourite music radio station. 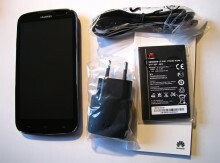 Because the Ascend G610 is not the newest phone on the block – it was originally introduced in the beginning of 2014 in Germany – it only comes with Android 4.2.1 Jellybean and while Huawei has decided not to upgrade its older devices, this one was bumped from 4.1.1 to 4.2.1 from its original Asian release. This is actually not a big problem and can also be an advantage if you don’t like the extremely restrictive external SD Card handling on Android 4.4 and up, because on this phone you still have full read/write-access to your card. 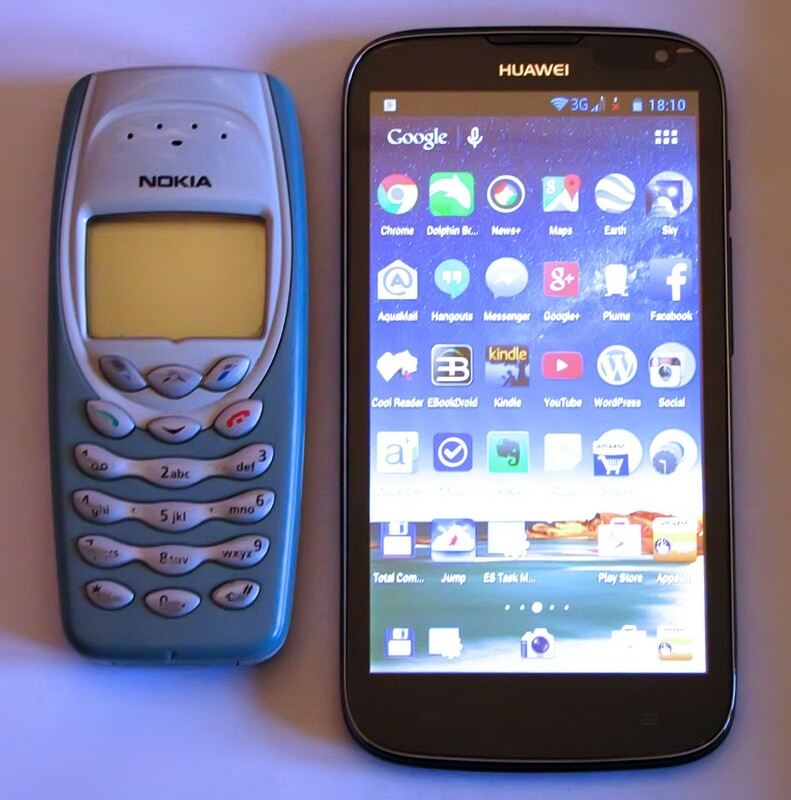 This was actually the main reason that I chose this phone in addition to the low price – I don’t mind having a slightly older Android version because app compatibility won’t be much of a problem and I can live without the additional features of Kitkat and Lollipop. 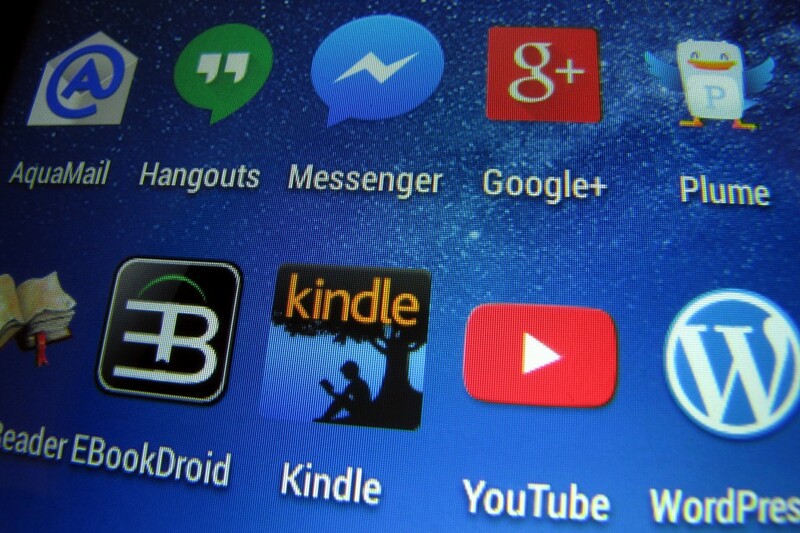 The power of the smartphone solely relies on the apps installed on it. As mentioned in the intro, the Android system of the Ascend G610 has been modified by Huawei with the light EmotionUI color scheme, undoubtetly to mimick the competition – but the user interface actually looks nice, even if it can’t be changed. For some reason, the top navigation bar became semi-transparent on my phone after a few days of use, with grey background on bright apps, almost transparent in Nova Launcher and dark on black backgrounds. I have not yet found out how this happened, since the bar was all black at the beginning, but it does look nice even though the blue text and icons are sometimes a little hard to read with a grey background. The Ascend G610 already comes pretty much well-loaded from the factory, with the whole palette of Google apps preinstalled plus some Huawei-specific programs. 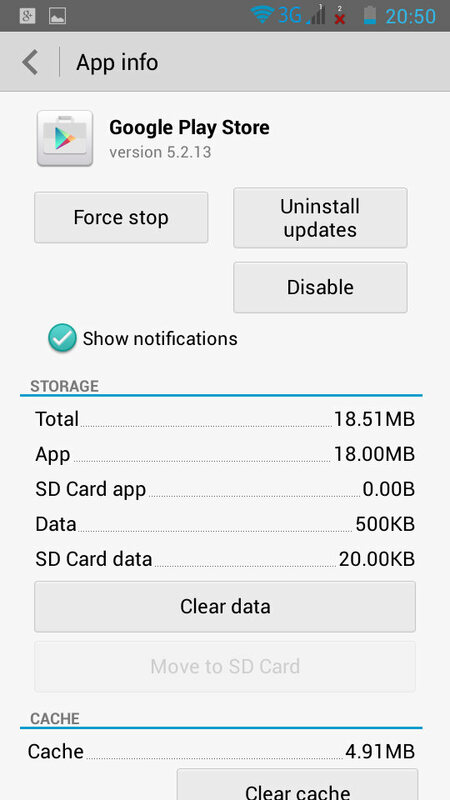 It is possible to uninstall all updates and disable the Google apps save for the Play Store so they don’t use any system resources and database space, but they can’t be completely removed without root access. It is usually a good idea to disable the Google Play Books, Games, Movies & TV, Music and Newsstand apps if they are not used, since the main Play Store works perfectly without them. The only problem currently on some Huawei devices with MediaTek chipsets like the G610 is that the icon transparency in the Play Store is broken, displaying black icon backgrounds – but this is limited only to the Play Store and is only a purely cosmetic peculiarity. An article with more Android app recommendations is going to follow this review soon, since it would make this one too large and I still need to write descriptions and make screenshots. 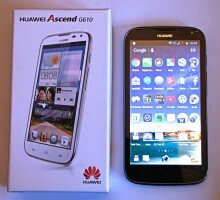 Huawei has produced an amazing smartphone in the mid to lower range with the Ascend G610 that barely shows its low price. While it is not a high-powered gaming device, it certainly works perfectly as what used to be called a PDA about a decade ago and is actually a very good 5″ miniature Android tablet with a solid cellphone attached. The large, bright display and the quad-core processor make this an ideal communications device not only for text messaging, but also social media and even blogging – and even a bit of fun and games are possible without problems. For a much lower price than the original €200 it was offered at the start of 2014, this phone is an amazing bargain and worth every cent.